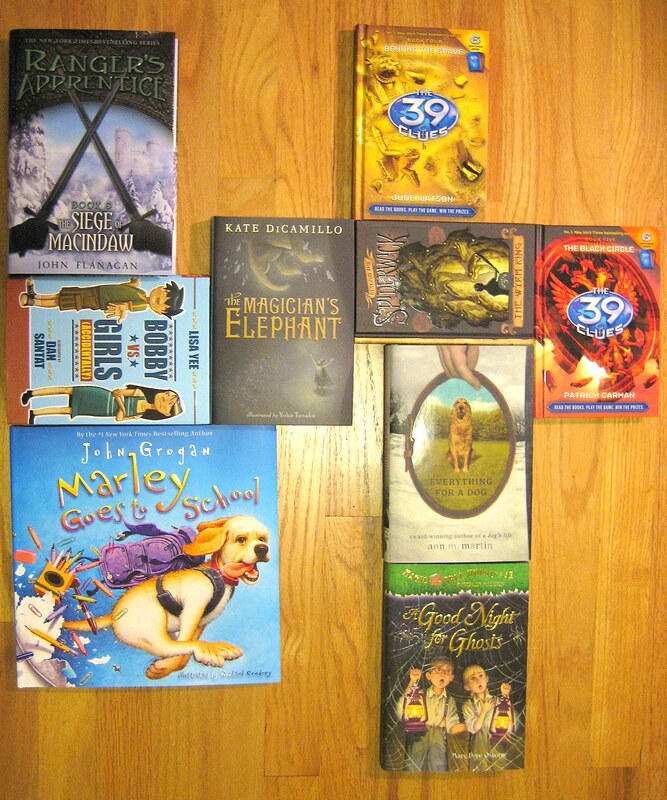 We’ve got some new 39 Clues, The Magician’s Elephant, new Beyond Spiderwick, and others. It never fails – the school year starts, student requests start rolling in, and you realize you don’t have the latest in-demand title, or the recent update to a beloved series. If you’re like me, you hate it when this happens (the “not having the book kids want” part, not the “student request” part). It took me a bit to figure out that I should do something that would enable me to pick these titles up during the course of the year. I couldn’t just spend my entire budget on one massive book order, or I would be left penniless and embarrassed in the face of desperate appeals for the new Ranger’s Apprentice. If you have the ability, I recommend dedicating a portion of your ‘flow to be spent at a local bookstore, so that you can buy requested books as they pop up. I do not, however, recommend using the term “flow” in reference to your library budget. It’s unprofessional, folks. No matter how diligent I am with book orders, titles always fall through the cracks. This helps fill in the gaps. I do the same thing. I like it, too, because there’s no wait for the order (or, heaven forbid, the backorder) for these popular books to arrive. Even more fun is taking a group of kids to the bookstore to help pick these books out! Wow, you’ve brought students to the bookstore to help make picks? I think you’re more daring than I. I usually just take a list (or a list in my head). That would be fun to have students there – any tips to share? I have. Just in small groups–4-5–of 4th and 5th graders, a couple times a year. It is so fun to tell them how much we have to spend (usually $100) and watch them debate what to get (and do all the math, including my 20% discount). It helps that I’m in a medium-small town and their parent bring them to the store to meet me. Ha – yeah I have to stop myself sometimes too. It usually happens when I’m tempted to purchase a book that is for an older audience than the school I’m ordering for. I only order once a month – and I admit to having told kids to get what they want from another library in our consortium. As I tell them – I can’t spend my whole budget on vampire books and star wars! It drives me crazy to have incomplete series, but we can’t fill them all in and it’s nuts trying to divine which ones are going to be popular. Once a month is much more often than I order, which ends up being a few times each school year. I agree with you about trying to keep up with every series – now that just about every book that comes out is a #1, it’s impossible to keep them all going. The whole “supply and demand” part of the job can be tricky. I am lucky that I have some “flow” money. Never enough though! Speaking of that new Ranger’s Apprentice…BRB!